Knowledge of the Input Splitter object, first read the preceding tutorial. The project file and Quartz Composer patch created for this tutorial can be downloaded here. Step 1: Add an Input Splitter to your QC patch and use the inspector to set it to the type of data that will be passed to VDMX. Step 2: Use the contextual menu (right-click) for the Input Splitter and select the option under 'Publish Outputs'. Supported data types are numbers, booleans, indexes, images, and colors. When applicable be sure to set the range. The rendered output from your patch show in the Viewer will automatically be available as a published image within VDMX, no need to create an extra image output for this. Mouse clicks from preview windows in VDMX are passed in to the patch same as the Viewer the Quartz Composer editor. Access the plugins folder quickly from the Help menu in VDMX. Adding the example plugin to the VDMX project. 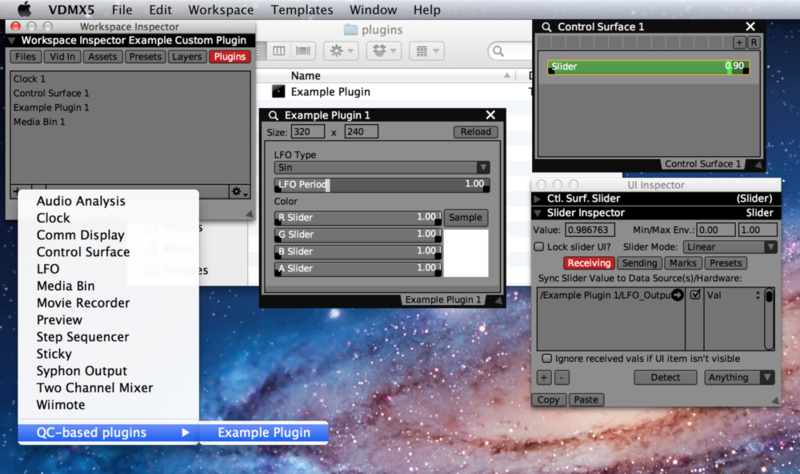 Step 3: Choose 'Open Assets Folder in Finder' from 'Help' menu and move the composition in the plugins folder. The patch now shows up in the list of available plugins. Step 4: Load the patch from the Plugins section of the Workspace Inspector. Like the standard built-in plugins the plugin created for your patch will appear in its own window along with an automatically generated interface controls for any published input splitters. Published number, boolean and index outputs will be available as data-sources to control sliders, buttons, and other UI items. Published color outputs can be used to control Color Picker UI items. Published image outputs are available as video streams in receiver menus.